Long hours, very little pay, and a bunch of young people who are forced to show up and listen to you lecture every day? What’s not to love about teaching? Sure there are a ton of awesome teachers, adjunct faculty, and professors but even the best teachers have moments when they’re just as over the semester as their students. Wait until you see how one teacher made a clone to handle their office hour visits. 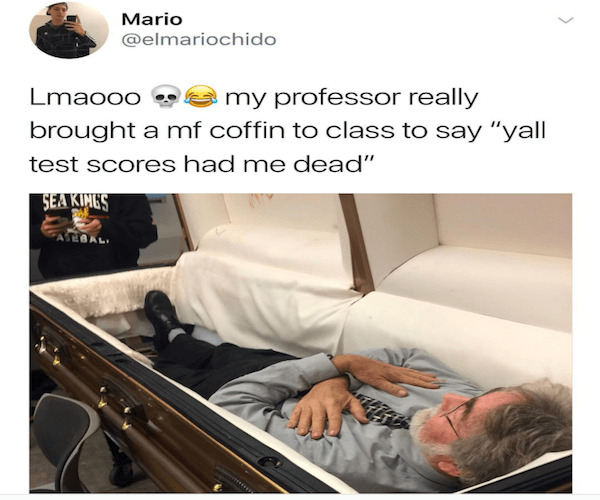 When your professor brings in an actual coffin to demonstrate how dead your grades are it’s not a good sign. Honestly, is this a result of the teacher failing their students or their pupils failing to understand the importance those little multiple choice bubbles they have to fill in 100 times during every test? The system has failed us!